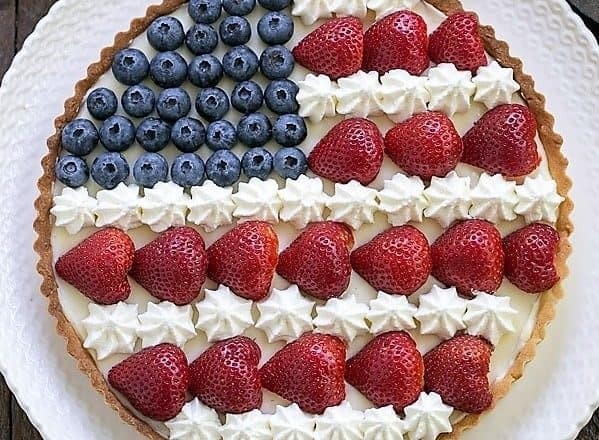 American Flag Fruit Tart: For the first time in years, I didn’t think we’d be hosting a neighborhood 4th of July party. So I decided to make a festive, patriotic dessert before the holiday. After polling the neighbors in June, it looked like many would be out of town for the 4th. Bill and I decided to try to get everyone together later in the summer. But then I heard that two of the neighborhood husbands were really going to miss the annual grasshopper pie, so the festivities were back on! Thankfully, Bill invited a couple work associates over for dessert after a business dinner to help polish off this early bird 4th of July treat. Between their rave reviews and Bill’s, I think I’ve found a second Independence Day tradition!! 20+ Red, White, and Blue Sunday Supper Recipes! This week, the Sunday Supper crew is sharing all things red, white and blue! 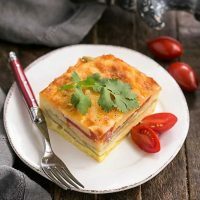 If your 4th of July menu is not finalized, you will certainly find inspiration from all these terrific bloggers. These would also be apropos for Labor Day, Memorial Day, Flag Day and all summer long. 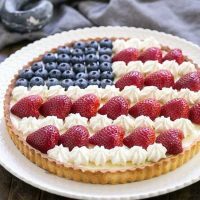 A sweet pastry crust with a luscious cream cheese filling topped with berries and cream to resemble an American flag! Crust adapted from Dorie Greenspan. To make crust,put the flour, powdered sugar and salt in a food processor and pulse to combine. Add the butter and pulse until the mixture resembles cornmeal with some pea sized chunks. Whisk the egg yolk, and add it a little at a time, pulsing after each addition. Continue pulsing with long 10 second pulses until the mixture comes together. Turn the dough out onto a lightly floured work surface and gently knead until any extra flour is incorporated. Press the dough into an 11-inch greased tart pan with a removable bottom. Press the dough evenly over the bottom and up the sides of the pan. Freeze the crust for at least 30 minutes. Top with a piece of non-stick foil or buttered foil and press it onto the surface. Place the tart pan on a baking sheet and bake for 25 minutes or until the crust is golden brown. Remove to wire rack to cool completely. When crust is cooled, make filling by placing all filling ingredients in a bowl and beat until the mixture is smooth. Scrape into the tart shell and smooth top with an offset spatula. To decorate, select the biggest blueberries and cut strawberries in half, removing the stems and hulls. Set aside. Whip cream with powdered sugar and pipe some rows of cream across the surface leaving enough space between for rows of strawberries. Leave one corner free of whipped cream for the blueberries. Add strawberry halves, cut side down, in rows, then fill the open area with rows of blueberries. Keep chilled until you serve. What a beautiful cream cheese fruit tart! 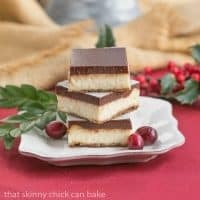 Love that simple cream cheese filling! Have a safe holiday, Liz. Your crust…well, your whole tart looks terrific, Liz. 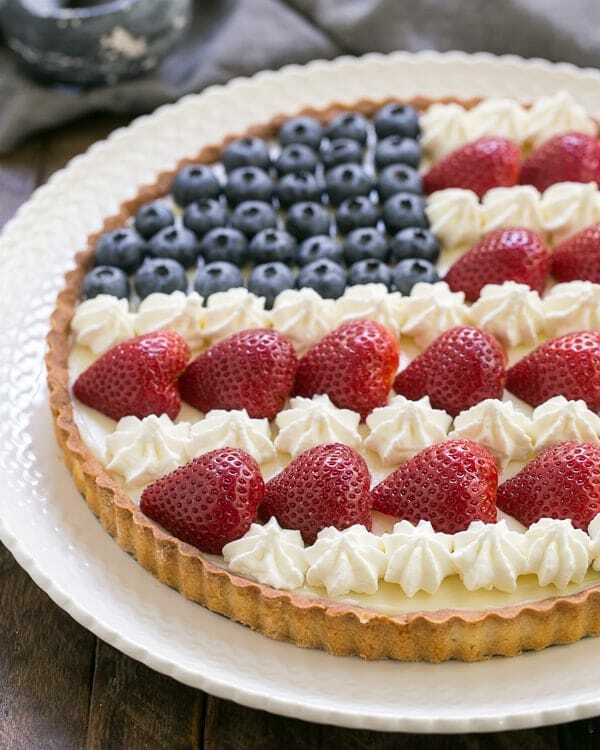 I hope to find my tart pan so I can make my own 4th of July tart =) P.s. Since you’re not obligated to give a party this year; why not catch a flight to California? What a beautiful and festive tart! 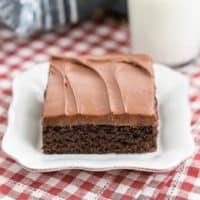 Love the cream cheese filling! Have a wonderful 4th! that is absolute Food Art at its finest Happy 4th and stay safe I already know you will be eating well! As always your desserts are stunning! If I made this it would look like a 2 year old made it. LOL Looks perfect for a 4th celebration. What a beautiful tart! It would be a gorgeous and delicious way to celebrate Independence Day! That is beautiful Liz! – food art. This tart looks absolutely perfect! I love that whipped cream piping. 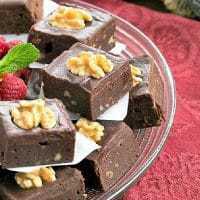 Woo-hoo a no bake filling! This also comes together in no time which is also a big plus and it’s pretty. I didn’t think you had posted because I wasn’t getting the usual email notification. Happy that I popped in and now I’ll play catch up! I love this so much. I think we’d fight over the blueberry slices! Our holiday celebrations have gotten more low key the past few years.. hopefully we can get them picked back up next year. Have a wonderful celebration! That is absolutely stunning! Yummy! I love this Liz. Your flag tart would definitely be a hit at my house. How fun and festive! 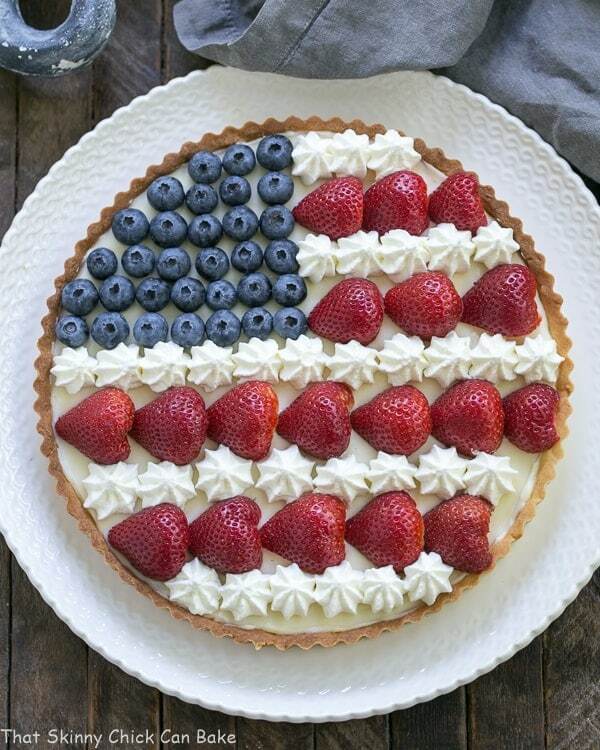 Now this is one patriotic tart! Looks so good. What a gorgeous cake! Hope you have a wonderful July 4th holiday! This tart is great. 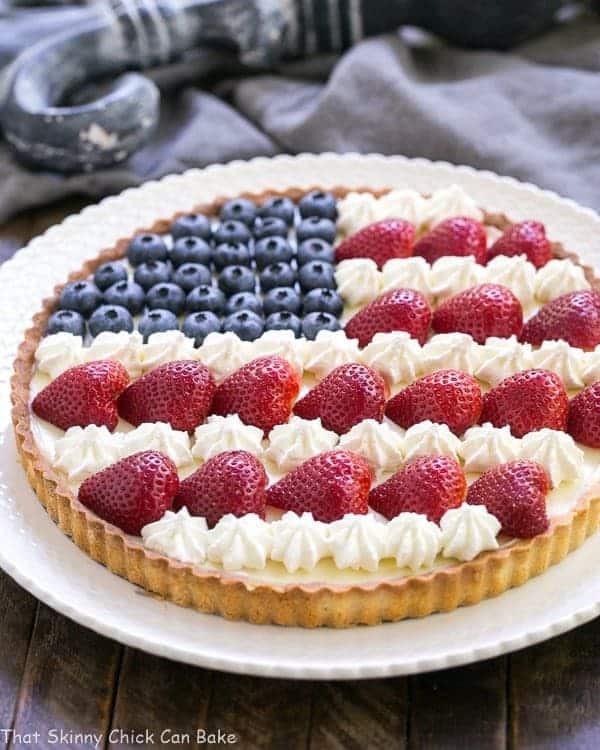 (Thanks for doing your part to make a great country even greater with this American Flag Fruit Tart.) Glad the 4th of July party is back on and that the Doc’s got some sugar after business. If I had a meeting, I would want to have it at your house. Loved your Switzerland photos. This sounds yummy. 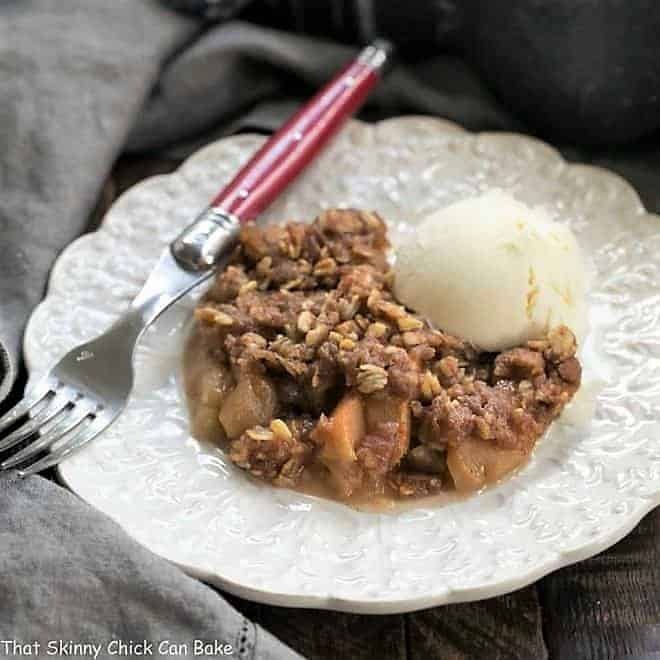 It would be a great dessert for the 4th of July. Hope you have a nice holiday! Gorgeous, gorgeous, gorgeous, Liz! I love how you piped the cream on in stars too. This is prize-winning pretty! Wow this is so completely gorgeous! I LOVE your beautiful tart and hope to give it a try soon. Have a wonderful 4th of July Liz! This is so pretty, Liz! I so wanted to make a fruit tart but I just didn’t have the time to make all the components. Love this, Liz! So pretty and sounds so yummy. July 4th is one of my favorite holidays! Beautiful tart Liz! Thanks for the tips on baking the shell! This is such a beautiful and festive fruit tart! Hope you had a wonderful 4th of July! It’s a beauty! Definitely tradition-worthy. I hope you had a great day on the Fourth! I just love the way your decorated the tart, very creative. This tart is so darn cute! You are an artist. I love the simplicity of the recipe too. Wishing you a super week Liz! 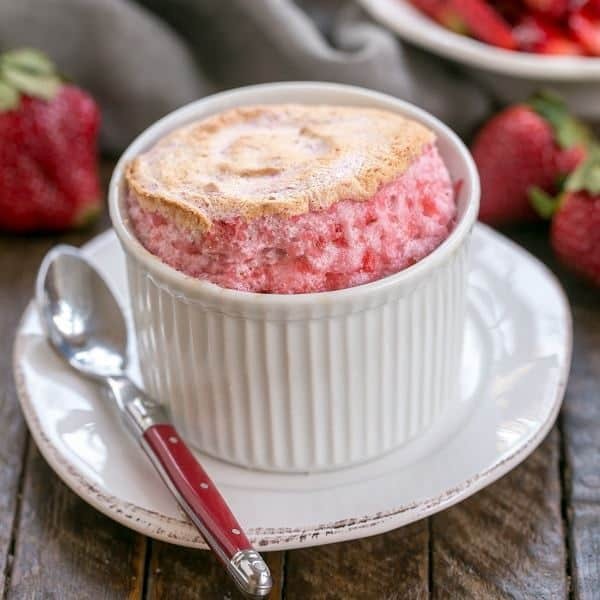 This is the most beautiful dessert for 4th of July! OMG could I have had this design in my head from a year ago. I don’t recall ever seeing it but my tart looks just like this. I know it’s not the same but still. 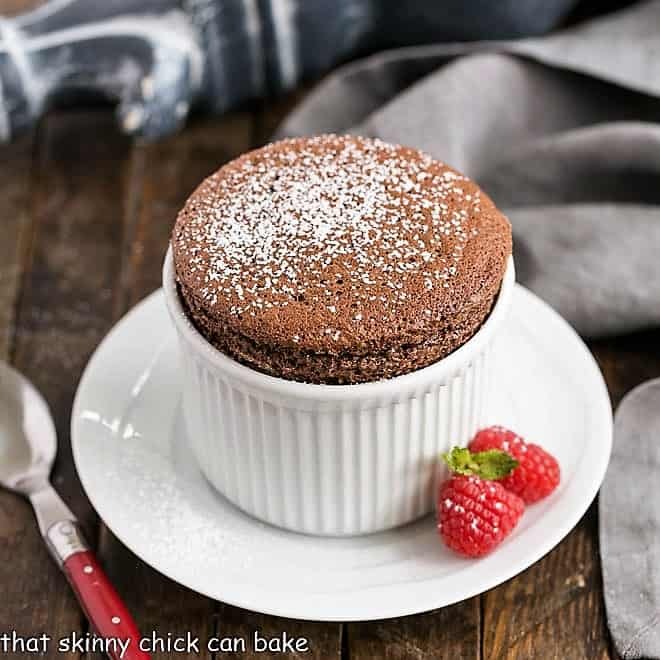 Well I think it’s beautiful and I’m sure yours tastes divine too! Hope you had a great 4th! Gee I’m sorry if I duplicated your design – if I did, it definitely wasn’t intentional. Liz it must have stuck in my mind. I just saw that I did post a reply from 2017. Wow I guess it left a HUGE impression on me.